Which is why, when the human mentioned we would be field-tripping there, it was time to bring out the classiest of classy outfits… A bowtie. You can never be too overdressed! Do I not exude class? Had to pull out all the stops when going to visit a designated National Historic Landmark. Behind me, the beautiful Biltmore Hotel. Did you know that many Hollywood TV shows/movies have been filmed here: Bad Boys, CSI Miami and of course, Miami Vice. Then, there were the guests that were truly gangster. No, really….Gangsters. Famous mobster like Al Capone and Thomas Walsh were loyal guests, since the hotel always had the most legit galas (aka. fancy parties), aquatic shows (think girls in bikinis) and gambling tournaments. During one particular tournament, Mr. Walsh was shot and killed. (Guys, it’s just a game, it’s not that serious) and it is rumored that his ghost still lurks around the hotel. (Hami Tip: stay away from the 13th floor!). Today, the Biltmore is THE spot people with class go (like me)…lol, just kidding. Anyone can enjoy the luxurious property (if you are willing to dish out the $$$). The hotel has luxe quarters ranging from fancy-schmancy rooms to several suites and even 3-bedroom penthouses. All have feather bedding, 340-thread-count Egyptian cotton duvet covers (whatever those are), sitting areas and windows with views of the golf course, pool or cityscape. Amenities include a full-service spa, an 18-hole golf course, a lighted tennis center, a 10,000-square-foot fitness center and a 21,000-square-foot outdoor pool (Hami Tip: do NOT pee in the pool). They claim that they have a ‘pet-friendly attitude’. This means that pets, 35 pounds or less, are welcome in the accommodations ONLY (as in, dogs cannot be visible in public areas – humph!!! what is that about..dogs are the cutest!). Guests with pets must leave a $500 advance deposit. 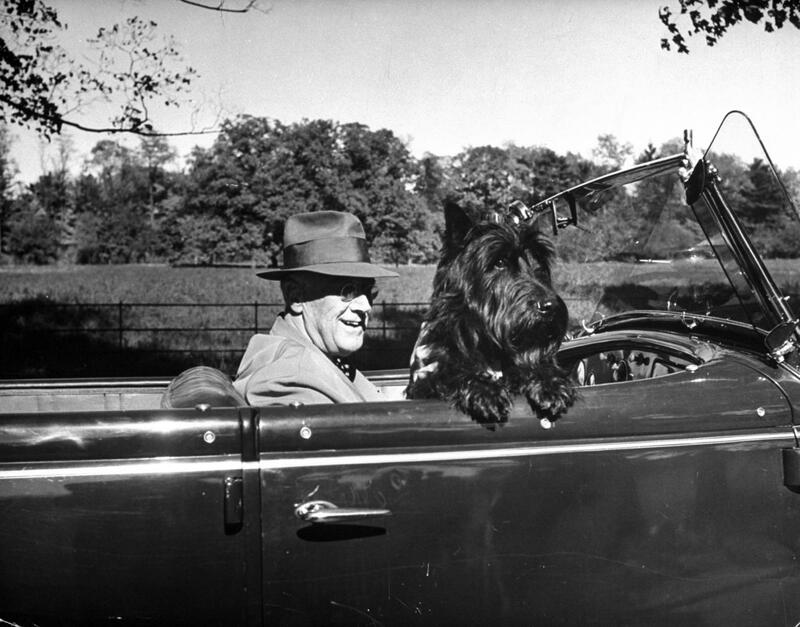 ***PS: In totally unrelated but totally related news, Mr. Roosevelt was a proud owner of a Scottie Dog named Fala. You had great taste Mr. President; excellent dog choice, if I do say so myself. Wonder if Fala was allowed to scottie-strut about the place back then? That was so fascinating, Hami! And your color coordinated bow tie is just the epitome of classy scottie attire! Can’t wait for your next post. I used to have a human blog, so I know how much fun it is!